That’s what Ottawa’s public transit system is called. So far, I’ve been on lots of buses. Buses from the VIA Rail station closest to downtown run extremely frequently. The ones just after trains arrive can be crowded. They hurtle along bus-only “transitways” till they reach downtown. The transitways sometimes curve sharply, so if I’m not part of a crowd, mutually propping one another up, it’s nice to sit down. My walk to the office takes less than half an hour. It’s through the University of Ottawa campus, dense with buildings, then onto a bridge over the Rideau Canal, finally past a few downtown blocks to reach The Hill. There are lots of busy students, whatever the time. Shorts and sandals were not unusual till just a short while ago: the Ottawa winters must make these young people hardy! Under the Laurier Street bridge, the terrain slopes very steeply down to the canal, and the roads next to it. The narrow, straight waterway makes a lovely contrast now with the fall foliage on either side. Ottawa is known for its ubiquitous sumac. These low shrubs’ branches are often airily-spaced; they have multiple long, narrow leaves that have turned spectacular shades of red by this time of year. Just over the bridge is the city hall, where I stopped by in September to buy my OC Transpo photo i.d., for $8.50. The cost to ride is different from what I’m used to in Toronto. Adult cash fare is $3.25. (Children under 12 pay $1.60.) I’ve never paid cash. Bus tickets are readily available, at convenience stores and many other outlets. Each costs $1.30; a set of six costs $7.80, so it’s no savings to buy in bulk. The savings comes in using them – a child uses one to ride, and an adult, two. There are no reduced-price tickets for seniors or students. However, seniors ride free on Monday and Friday afternoons, and all day Wednesdays! A monthly adult pass costs $94, but a senior monthly pass is only $37. Students can buy monthly or semester passes. I bought a senior pass for October and one for November, must show my photo i.d. when I use it. Confirming that I’m on the right bus is easy – drivers are very helpful. One dark and stormy night, I hopped a suburban bus for a short way. Either my monthly pass extends to those or the driver was generous. I believe the pass works for the commuter O-Trains, but I’ve not tried them yet – something to look forward to. The first day I hoped to ride free, I hadn’t yet gotten my i.d. card. I asked someone else waiting at the stop what sort of i.d. was necessary. “Just get on as though you own the bus,” he said. “The drivers rarely ask.” And he added that the sometimes-free system has made a huge difference for the many Ottawa seniors who otherwise can’t often afford the bus. This must keep older people healthier, as they can travel to needed medical appointments, and more active; it probably also increases visits to local attractions and stores. Several different bus routes take me more or less near ‘Confed’, as locals call the Confederation Building, where Elizabeth’s office is. I can ride through the campus, or walk half a dozen blocks to Rideau Street, for one of the numerous buses there. West across the canal, Rideau becomes Wellington, and the bus promptly reaches Parliament Hill. September brought major service cuts. During peak travel times, buses get too full to stop. Sometimes extras (marked X) are added; their routes are truncated. As most routes are very long, passengers now need to transfer more frequently. Transfer points are usually called stations. Some stations are street corners, and some are along sidewalks at significant locations. Many are concrete with glass walls and red tubing around them and around the stepped, curved glass roofs – a characteristic look around town. Buses are infrequent in the evenings, so I’ve learned not to stay too late at the office. The new system means some split shifts for drivers, disrupting their personal lives. On early evenings, I sometimes catch a bus just south of the National Arts Centre. 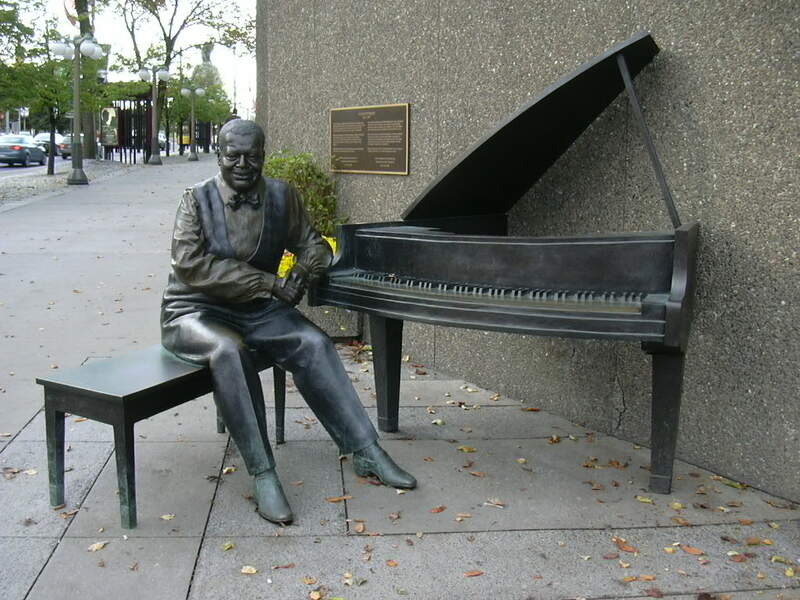 Passers-by can hear the Oscar Peterson recording. Maybe I should have asked a fellow pedestrian to take my photo, sitting on the piano bench next to the sculpture of him.